Added a few new details to the patio this week and thought I’d pop in to share. I’m sure some of you may wonder why I’m not calling this a done deal…because, yes, it’s looking pretty good – scratch that…AWESOME as is. But I had a few more things to do out here. What things? I am so so sooooo in love with the throw pillows and string lights I added this week! It annoys me to no end seeing that, but after playing around with the strings for a couple hours, I gave up and realized that is the best I was gonna get. The clear bulbs appeared too bright to me so I opted for the subtle look of frosted bulbs. The light strings hang beautifully on a cup hook! I also grabbed a few throw pillows for the sectional. The couch wasn’t the color I originally hoped. I wanted to go much lighter, but ended darker because reality sank in….reality = I have kids. Kids with friends. I wanted to keep this space useable and realistic…and I know my personal crazy tendencies. No one wants/needs to see Sam in “don’t eat that right there” or “don’t sit down until you wash your hands” mode. Not pretty or becoming. But it’s me and it’s real…so I choose to embrace. The pool organizer is moving to a new location as soon as I find a table. Haven’t found anything I love yet…and you’ll think I’m crazy but may consider building my own. I know! Someone stop me. Out of control over here. Ha! Just need a place for platters and drinks. This could be fun! So, when are you guys coming over?…. Want to find the items used in this space? Good timing, because many are on sale right now! You can find them below! Some affiliate links were used for your convenience. I'll be right over!! 🙂 Your patio is amazing. Love it!! It looks so cozy. We have very similar taste!! I've been eyeing those blue medallion outdoor pillows from PB too – I had them in my cart and now I wish I had already ordered them. A couple of years ago I got some of Target's bulb string lights too and quite a few broke also. I think outdoor string lights add so much to the ambiance of an outdoor space. Well done! Looks so nice!! Where di the table and chairs come from? I ALMOST bought these the other day…but was hesitant because i kept reading that they break so easily. Maybe i'll give it a shot now that you've shown the best way to hang them!! i love the look btw…awesome job! I love it Sam!! I have wanted to put lights up on our patio. Thanks for the cup hook info. Have a great Memorial weekend! 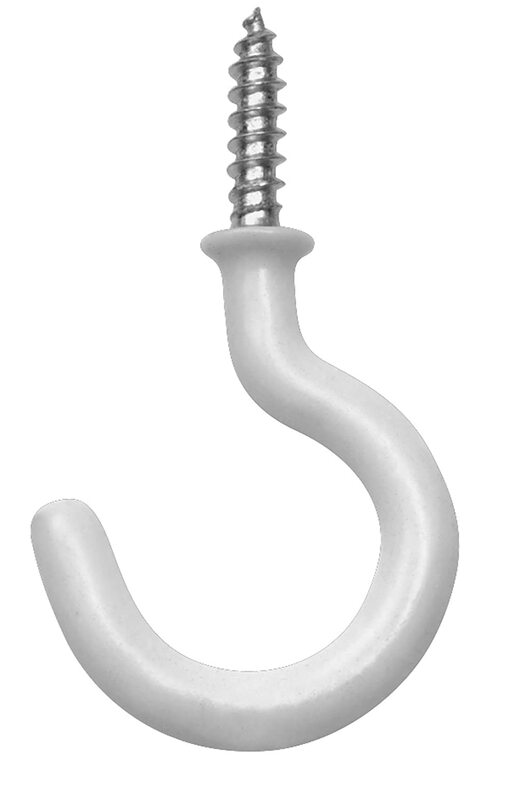 Would you mind sharing some photos of the cup hooks? Where they are in relation to how the lights are hanging from them? Wow – what a wonderful space to relax in! Just a thought – what if you painted (or covered with tape or fabric) the plug connectors? If you covered them in the same color as the ceiling they might blend in and not be seen . . . just a thought! Thanks for your blog – I enjoy your posts!! Thank you! The screens were here but I’ve since replaced them as they were tearing in some spots. I did blog about it but I’ll be updating as I haven’t added the wood trim yet. Be on the look out! I’d like to see the screens up close. We have a very similar setup on our back porch. The openings are about the same size as yours and I’d really like to get screen windows in the openings. I’ll share photos with you very soon! I’m having the screens updated / replaced in the coming weeks and adding a new screen door. The rainy winter we had took a toll on the screens out here. Will be sure to update soon! Where did you get the dining table and chairs? Very Pretty set! Thank you – we do love it! It’s from Restoration Hardware. The Carmel Collection, I believe. Have owned this set for nearly 10 years and it looks brand new! Love this! This is basically what I’m planning for my screened in patio. Was debating white furniture but I think with white walls the darker furniture grounds it more. I also have 2 young boys and don’t want to be tempted to be “crazy mom” and darker is easier to find. My patio ceiling and a few walls are a bright yellow. We are going to eventually have someone install flood lights and outdoor ceiling fans and out in a beadboard ceiling to clean it up (you can see nails from the roof in my ceiling) but I’d love to paint at least the yellow parts until we can afford all that. What color dis you use? I don’t want a stark white but nothing too creamy. Some parts are wood still, thinking I’ll leave them bc A, I’m lazy and B, it’ll add some interest. I’m hoping to eventually install panoramic doors on mine as my yard is small and the doors would help the whole space flow and enlarge it. Wish me luck! Such an expense! Thank you! I love it too! Can’t wait to get the space cleaned up after this brutal rainy season is over and get back out there to enjoy the space! Your plans sound wonderful! I painted the walls Silver Drop by Behr. And the ceiling is Sea Pearl by Benjamin Moore. Had the paint from the house interior so I made it easy on myself. We love the combo! Be sure to check back with me when your patio is completed so I can see it! Can you please send me the link to the frosted string lights you used on your porch? Thank you! I love the patio ! Where did you get the sectional from? I love it ! I’m interested in where you got the sectional as well please! Hi, I am going to get a screen porch and adding additional area with new studio roofed screen porch. If we put these space lights and keep them for all year around, would it be safe if its heavily raining outside and some water may get in the porch? I also see a tv hanged on the wall in your porch. How did you protect it in rain and dust? This screened it porch it totally protected from the outside elements. If the rain comes in – it’s usually because it’s rainy AND windy…rare in the area I live in. The lights have never been affected or touched by rain…same with the tv. I do have a cover for it that I add when we aren’t using the patio (seasonal). If you think that your new patio will be touched by water in that way, I’d proceed with caution. Maybe speak to a handyman or electrician pro that can give you all the details / help set you up safely. Love this! Using this as inspiration for my porch. What are the dimensions of your porch?